I can't believe I am actually posting a Star Wars craft on my blog... but I am. I don't dislike Star Wars, but I'm not a die hard fan. My 5 year old loves playing Star Wars Angry Birds on our iPad though and through that has gotten hooked! He has learned every character and spends his free time making Star Wars ships with his Legos. Today is May 4th... so I had to post this craft today in honor of the date. Recently we purchased a set of Star Wars: Phonics Boxed Set and my kids have been reading them and checking out the pictures. They love Yoda. Since my 5 year old loves Yoda, my 2 year old does too. Yesterday while the baby napped we crammed into my guest room to play while trying to avoid the loud sounds from our remodel. 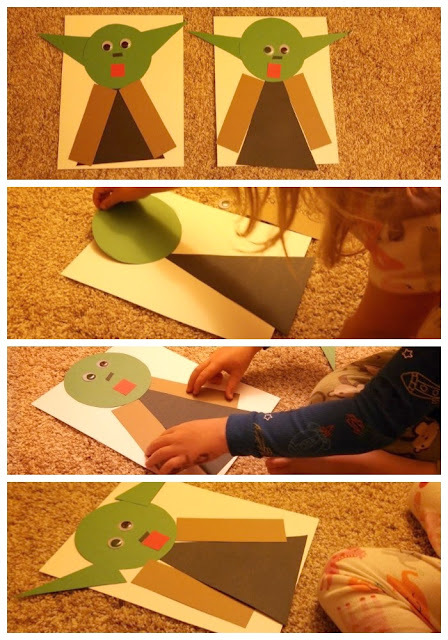 The kids thought it would be fun to make our own Yoda, so we came up with this shape craft. 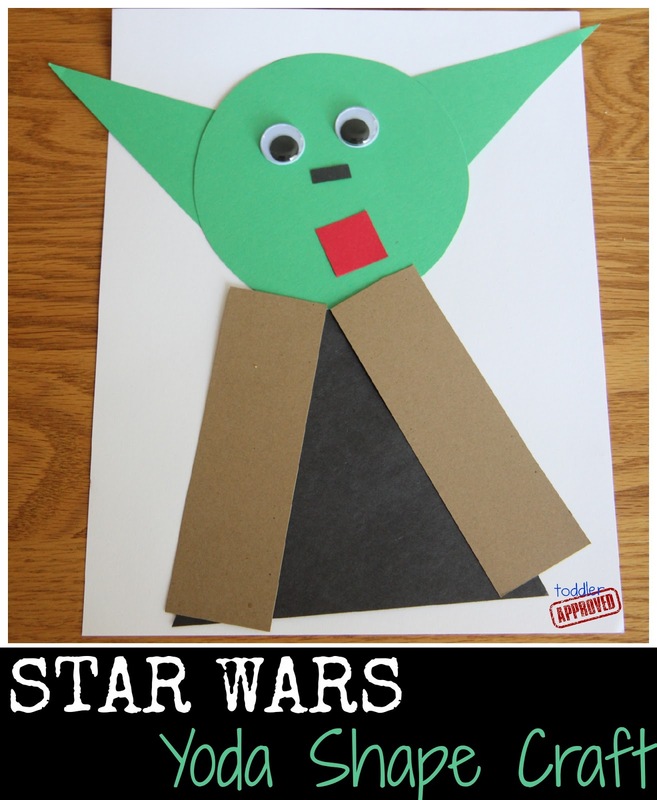 This Star Wars Yoda Shape Craft kept the kids busy and laughing as they talked about colors, shapes, and characters from the story. The best part about the craft was that it was easily prepared in just a few minutes. Cut out two brown rectangles (cape), a large black triangle (body), a green circle (head), 2 green triangles (ears), one red square (mouth), and one tiny black rectangle (ears). Once materials are cut out, let your little ones start creating! Originally we planned to glue our pictures down, but the kids had so much fun making Yoda again and again and again that we might just laminate the pieces instead of gluing them. My toddler watched her brother put his Yoda together a few times before she made hers. She was SO PROUD of the Yoda she created (above). I think it is adorable how excited she gets about her brother's obsessions. If you have a Star Wars fan at your house, you might also enjoy these free Star Wars Printable packs by 3 Dinosaurs and Royal Baloo. We printed off parts of the pack created by Royal Baloo yesterday and had a great time with addition clip cards and writing numbers 1-30. It is amazing how extra motivating it is to learn when there are cool pictures of your favorite characters embedded into your activities. My toddler carried around the Yoda addition clip card all morning. 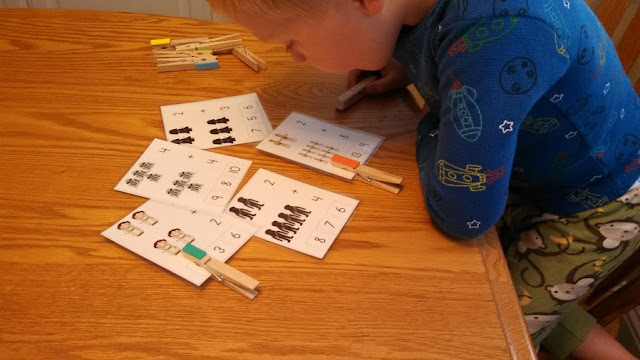 She loved putting the clothespin on different numbers and talking about the numbers. Although she can't do addition, she still enjoyed using the clips to help her talk about other numbers. Have an excellent May 4th... whether or not you choose to do anything related to Star Wars. If you have a favorite Star Wars themed craft or activity, come share them in the comments. The perfect craft for a book club for boys (or girls) using The Strange Case of Origami Yoda by Tom Angleberger! ha ha- perfect! My daughter is busy drawing Princes Leia right now (My husband is on a - May the 4th be with you kick). This is our next project! Thanks for sharing! I love this, so so cute! Thank you so much for this! I was searching for the perfect birthday card for my 2-year old daughter to make for her dad! I will be joining her Yoda art with the saying "Your birthday it is, Celebrate you must!" Perfect for her little hands and short attention span!